uses her superiority and influence to intimidate others to get what she wants. EVERYONE in AMERICA MUST know what kind of person she is!!! YOU CAN HELP!!! 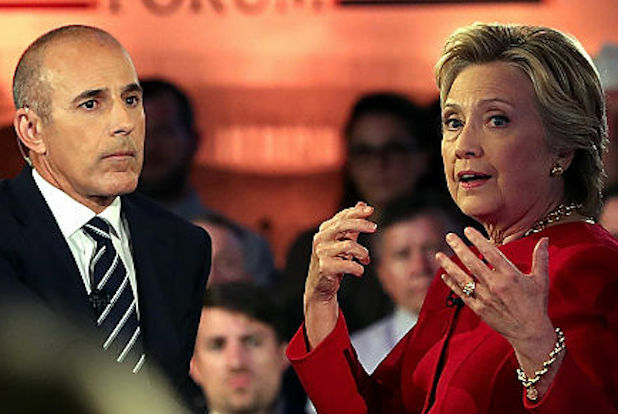 Behind the scenes, NBC technicians and cameramen at the Wednesday night, Commander-in-Chief Forum (Sept 7) report that Hillary Clinton was so angry and incensed that she had been ‘blind-sided’ by one question she was not prepared for and had not approved. Clinton finally stormed off the military ‘set’ and the assistant producer said she was screaming that she wanted to talk to “the idiot who set this mess up...you do not blindside me - ever!” and continued to demand to speak with executives at Comcast, parent company to NBC Universal. Her dozen or more aides were visibly disturbed and tried to calm her down when she started shaking uncontrollably. That did not stop her from demanding an executive “on the phone, now!” She was told the executive-in-charge of the forum was ready to talk with her and she was led away by two rather large aides who appeared to help her walk. Calls were made to New York Times, Washington Post and Huffington Post and Twitter executives with orders to “Crush Matt Lauer”. As you can easily see with all the headlines from these MSM sources, they did as they were told by the Clinton campaign. Hillary also screamed that she would be “treated with respect at the debates or heads will roll.” Staffers at the Clinton campaign report that they fear her wrath and uncontrollable outbursts, and one described Hillary as “an egotistical psychopath”.